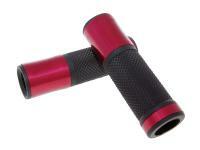 For the sporty custom tuners, we offer these high-quality grips with CNC machined aluminum components. An absolute "must-have" for those who want to refine their vehicle. These grips are open and allow the assembly of handlebar vibration dampers without the hassle of cutting a rubber grips.